On the pulse of time - there you'll find AUDIUM products! range speaker Comp 5. The active version makes a power amplifier obsolete. You can connect your audio source e.g. a network streamer or your PC directly to the loudspeaker. This is made possible by a specially designed amplifier module. It powers the full-range driver and the oval 6x9" woofer mounted in the bottom plate of the loudspeaker through a 30W and 100W digital amplifier respectively. The integrated DSP performs the work of a classical crossover network and additionally allows an adaptation of the speaker to your listening room and your personal listening preferences. In the current version 2 of the amplifier module we did not only optimise the sound, also the user interface has been completely re-implemented. 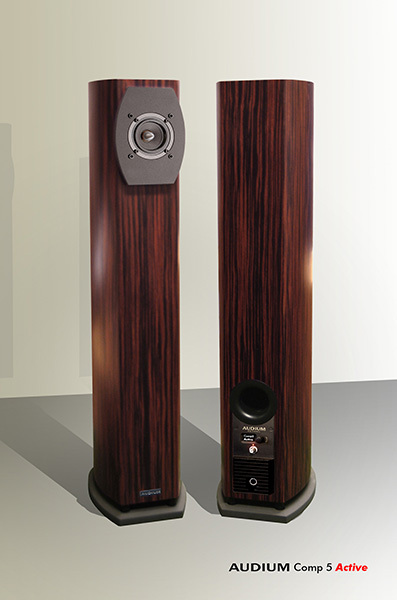 A rotary encoder and a graphics display allow untuitive adjustment of all loudspeaker parameters. This makes installation and setup the speaker an easy game! AUDIUM Comp 5 Active on the pulse of time! Copyright © 2007 - 2019 Frank Urban, AUDIUM, Catostr. 7b, 12109 Berlin, GERMANY. All Rights reserved. The information in this document is subject to change without notice. Please read our Credits.